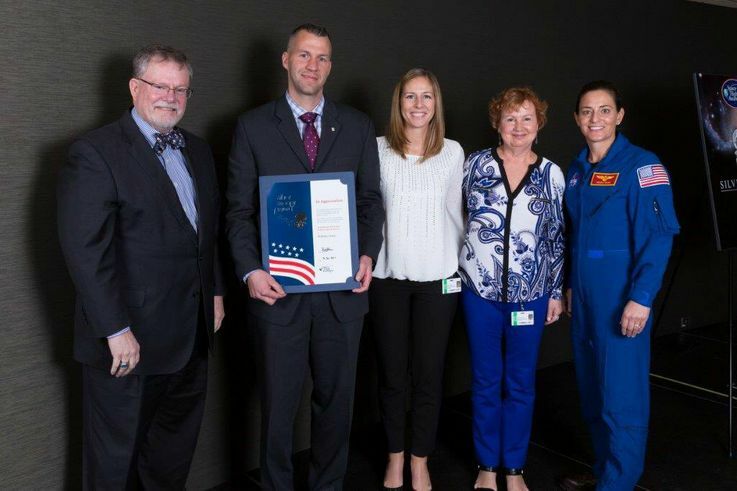 Each year, less than one percent of the aerospace program workforce is honored with a Silver Snoopy Award, recognizing outstanding performance to those contributing to flight safety and mission success. This year, NASA astronauts honored Orbital ATK employee Dr. Bill Green with the award, which included a sterling silver Snoopy lapel pin flown on a space shuttle mission, a certificate of appreciation and acommendation letter signed by an astronaut. Green's leadership, technical excellence and dedication to the development of the attitude control motor valve control system, which supported the Orion Launch Abort System HT-11 Hot Fire Test, earned him the recognition. Dr. Bill Green poses with his award after the December 12 ceremony in Denver, Colorado. Green successfully led the integration and testing of the valve control system into the attitude control motor, a key component on Orion’s Launch Abort system. Orbital ATK is providing the attitude control motor for NASA’s Orion Crew Exploration Vehicle, which is being developed by Lockheed Martin. The attitude control motor has two critical functions. It first steers Orion’s launch-abort system and crew module away from the launch vehicle in the event of an emergency. Once cleared from the hazards, the motor then orients the capsule for parachute deployment.